The Addis Ababa Confucius Institute (AACI) on Thursday signed agreement with the Addis Ababa and Hawassa Universities to establish Chinese Language Learning Centers in the two universities in Ethiopia. The signing ceremony has taken place on the premises of the AACI in the presence of members of the visiting Chinese High Level Delegation to Ethiopia from Tianjin Municipal Government, which is led by Xing Yuanmin, the chairperson of Tianjin Municipal Committee of Chinese People's Political Consultative Conference (CPPCC), and also officials from the Ethiopian side. Speaking at a donation signing ceremony, Liu Kun, Secretary General of CPPCC, Tianjin Municipal Committee, said the AACI has launched many training programs and been offering opportunities to Ethiopians who are interested in Chinese language and culture. According to Xing, similar center has been set up in Mekelle University, about 780 km north of Addis Ababa, and now in Addis Ababa University and Hawassa University, about 400 km south of Addis Ababa. "I wish AACI a bright future, wish China-Ethiopian educational cooperation and exchange a higher level, wish friendship between China and Ethiopia last forever," he said. Kaba Urgessa, Ethiopian State Minister of Education, said China has been supporting Ethiopia's endeavor in human resource development program by providing long and short term training opportunities to Ethiopians. He said the signing of the agreement for establishing Chinese Language Centers would further enhance the friendly relation and cooperation between Ethiopia and China. "It is our strong belief that the training opportunities which has been provided by the People's Republic of China for the last several years is a great help to achievements and progress so far Ethiopia has made in the education sector," he said. "Today's signing ceremony of establishing Chinese Language Centers at Addis Ababa and Hawassa Universities is also one of the manifestations of further strengthening the existing friendly relationship between the two sisterly countries," said the State Minister. 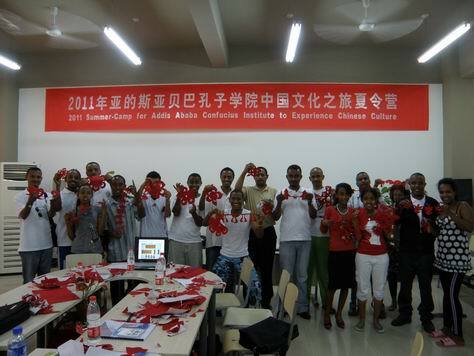 He also appreciated the AACI for its efforts in establishing Chinese Language Centers in Ethiopian Universities. "These centers would serve as platform for cultural exchange between the people of Ethiopia and China, in general and Confucius Institute and our universities in particular," he said.